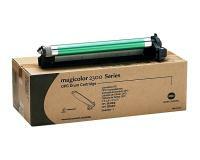 The message window will display which toner cartridge is empty by displaying TONER EMPTY [COLOR]. 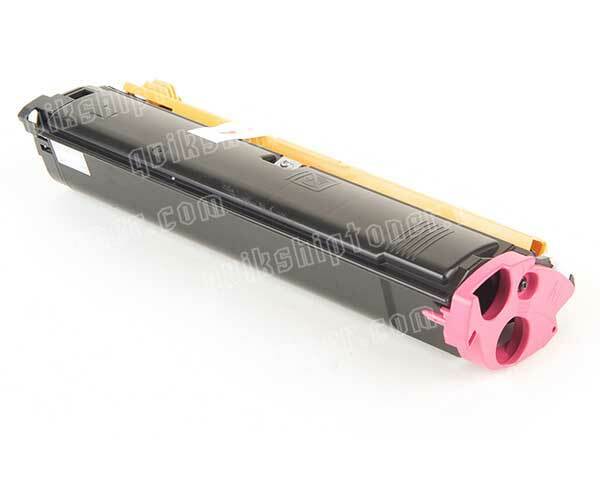 When this appears, press the MENU SELECT button to automatically cycle the toner so that the correct color will be removable, then open the front door of the printer. Pull out the toner cartridge by inserting fingers into the two holes in front of it. 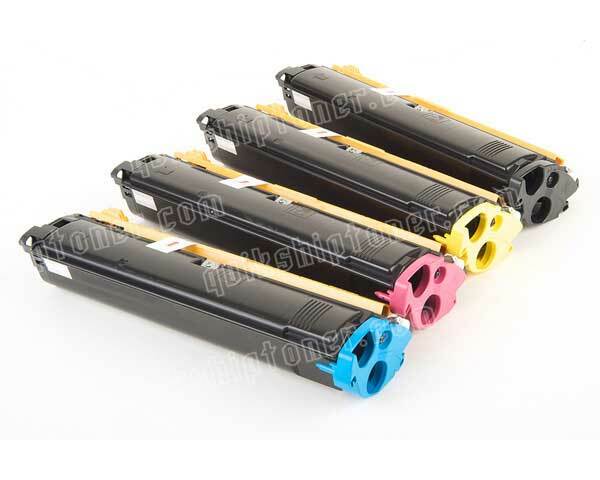 Before discarding the used cartridge through a recycling program, check that the color and size matches that of the new toner cartridge to be installed. If the cartridges are a match, shake the new cartridge in various directions to break up the toner inside, then remove the yellow protective cover from the cartridge. 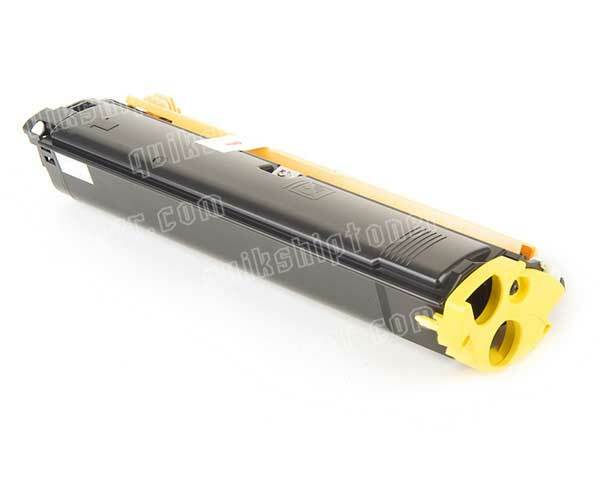 Before installing the cartridge, make sure that the color on the compartment inside the printer matches that of the cartridge itself. The Konica Minolta Magicolor 2300DL WILL ACCEPT toner of incorrect colors and therefore installing the wrong will could damage the printer. 1) When IDLE MAGICOLOR 2300DL appears, press MENU SELECT. 2) MENU LANGUAGE will appear. Press RIGHT ARROW. 3) MENU ENGINE will appear. Press MENU SELECT. 5) When ENGINE CHANGE TONER SZ appears, press MENU SELECT. 6) Select the correct color. Press RIGHT ARROW. 7) When [COLOR] HIGH CAPACITY appears, press MENU SELECT. 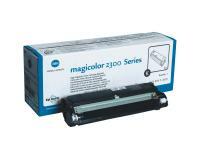 Printing in full color as well as black and white, the Konica Minolta Magicolor 2300DL is a conceivable option for adding color print hardware to a small office’s set of appliances, though the unit’s painfully slow print speeds make it undesirable for anyone who requires any sort of high performance printing. Dell includes a set of black, cyan, magenta, and yellow cartridges installed in the Konica Minolta Magicolor 2300DL, making it ready to go virtually right out of the box. Network support also keeps setup times fast and allows an entire office to connect to the unit. While the unit’s speed is slow, its resolution is high. 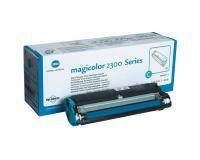 Color print quality can be set all the way up to 2400 x 600 dots per inch, making near photo quality color printing possible. The unit is also compatible with a variety of special media types, including glossy and photo paper, allowing users to take full advantage of the high quality color print capabilities provided by the machine. With a monthly duty cycle of 35,000 printed pages, the Konica Minolta Magicolor 2300DL should have no problem operating in constant use. 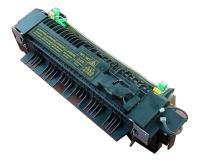 Its CPU operates at a 233 MHz speed and the device’s included RAM totals 64 MBs. A Parallel and USB port are included in the hardware along with the fast Ethernet connection, making a variety of connection options available. 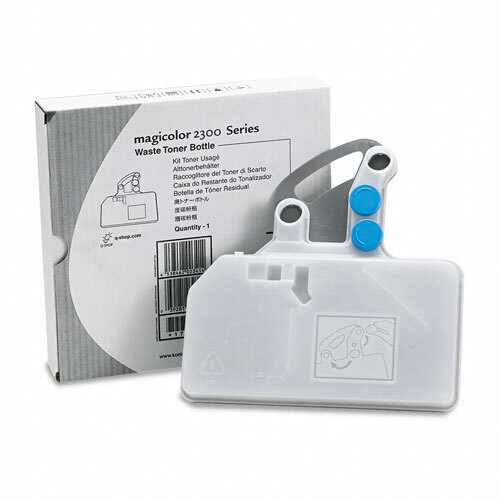 There is no shortage of paper storage when it comes to the Konica Minolta Magicolor 2300DL, as its maximum tray capacity is 500 sheets, or a whole ream’s worth of paper. Additional paper storage can be added as well if more is needed. The paper tray and ports on the Konica Minolta Magicolor 2300DL are inconveniently placed, giving the design a less than well though out feel and slowing down workflow slightly. The LCD on this unit is also very dim, making it hard to read and occasionally frustrating to try to use. More importantly, however, is the fact that the Konica Minolta Magicolor 2300DL in general is ridiculously slow to print. Its color print speed tops out at a cringe worthy 4 pages per minute, and that’s when dealing with an image the size of a postage stamp. Printing a photo sized color print or one that fills a full page will take multiple minutes to complete, especially at higher qualities. Black and white print speed gets a boost up to 16 pages per minute, which is still atrociously slow for a full sized laser printing device. With dimensions of 15 x 14 x 19 inches (W x D x H) and a weight of 55 pounds, the Konica Minolta Magicolor 2300DL is on the large side for a printer, even a color one. It will take up quite a bit of space on a desktop yet is not quite big enough to be considered for floor standing use, unless the additional paper trays are installed. Either way, much more compact units with much faster print speeds are available now for reasonable prices, making this washed up printer nearly obsolete.